As land use increases, some councils have sustainable land use requirements to ensure buildings are designed to be considerate of the surrounding environment and community. Hard to Soft Landscaping ratio is one measure used to ensure urban rainfal is able to soak in to the ground and replenish the water table. With residential development sizes increasing, keeping within the ratio set can be a challenge. If you are a Home Owner looking at building or renovating your house surroundings, you may be looking for guidance on the specific advantages of using StoneSet with regard to your building works. The council has set a number of guidelines and rules that one must follow when paving surfaces to comply with the building law. These apply to driveways, gardens, extensions and other paved areas. Uniquely, resin bound stone achieves a very high porosity rate owing to to large number of voids that form when the resin sets and forms multiple cross links. StoneSet achieves a fully permeable surface is when StoneSet is applied over the specified 150mm ‘compacted road base’ and gravel cell before applying the resin stone mix at 25mm layer. This achieves a porous base and overall permeability rate of 103L/sqm/min, essentially as porous as soil and grass. 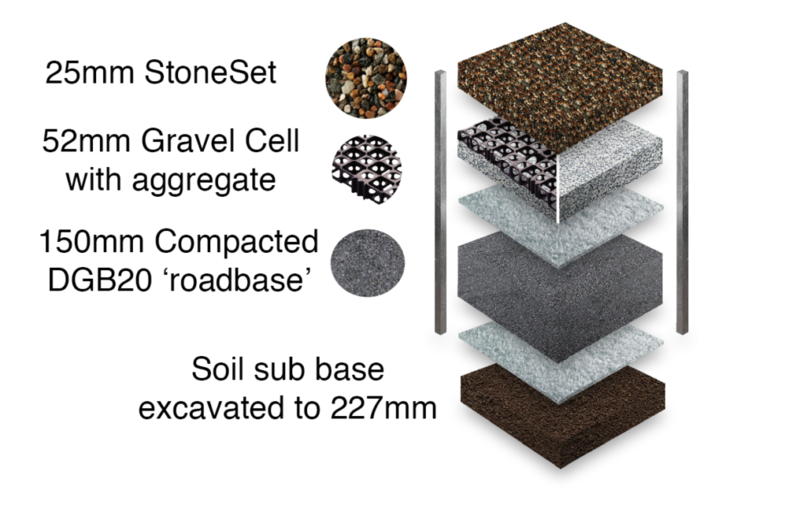 Below is a summary of the different layers that comprise a StoneSet fully porous driveway. You can download the full details of the required preparation. StoneSet has a porosity rate high enough to satisfy councils and certifiers it can be classed as soft landscaping. Even with some of the most demanding councils hard to soft landscaping ratios in Australia.